Please, please, please go buy a few fresh porcini mushrooms that are now available at Whole Foods. At 40 bucks a pound, they are not cheap, but you will not often have the chance to get your hands on these rare gems. They can't be cultivated, so like truffles, they must be found in the wild. The Wife says they taste like bacon. I'll have to take her at her word. All you have to do is get them to the plate without messing them up. This entails sautéeing them in a little bit of butter, seasoning them with salt and pepper, and serving them over pasta or polenta. It is that simple, and it is money well spent. 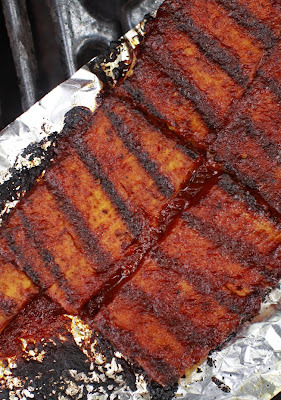 Does your BBQ tofu look like this? I wish you could taste it. This tofu has it all: smokey, spicy, tangy and sweet. 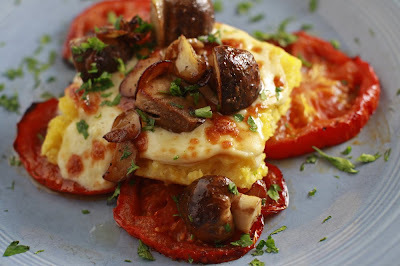 Come to my vegetarian grilling class and I'll show you exactly how to make this veggie classic. Register HERE. The first figs of the season are in, so we picked up a box at Whole Foods. Looking at the price tag on them made me long for the upcoming mid-summer days when local figs are abundant. We track the daily progress of the few green fruits on the two fig trees we planted last year, and cannot wait for the fruit to ripen on a huge tree that hangs over into my older brother's yard. This simple salad is a celebration of the fig. The other ingredients are designed to coax out the sweetness inherent in the fruit and then balance it out. Whisk all ingredients in a large bowl. Cut peeled beets into bite-sized pieces and sauté in olive oil until tender. Remove beets and set aside. Place slices of bread into the pan to soak up the remaining olive oil. Allow the bread to brown in the pan. Add the spinach to the dressing and toss until evenly coated. 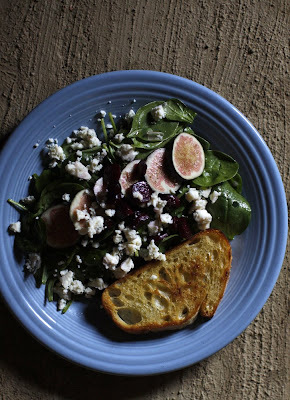 Arrange spinach on a plate; top with sliced figs, beets, and crumbled blue cheese. Serve with grilled toast. This meal, in all if its variations, is by far my favorite breakfast. It's fast to make, portable, and you get your veggies and your protein all in one delicious rolled-up package. This incarnation is particularly special as it is made with leftover grilled portobello mushrooms, green peppers, onions, and fire-roasted poblanos. Additionally, it is made with a combo of both duck and chicken eggs. The duck eggs have a much larger yolk (as you can see in the photo) and a far creamier texture than conventional eggs do. If you ever get the chance to get your hands on a few, you should. They are wonderful. The veggie, chile powder, and a few tablespoons of olive oil go into a pan over medium-high heat. Sauté until the veggies are cooked through. Remove veggies from the pan and add eggs. 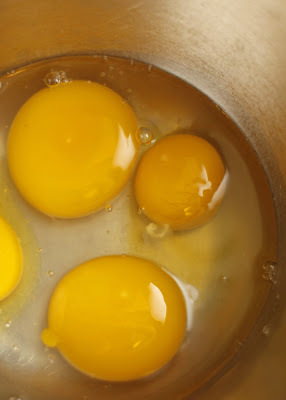 Move eggs around until almost cooked through. 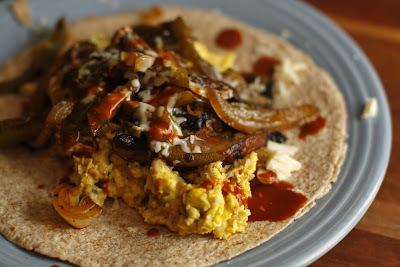 Top tortillas with eggs, then add veggies. Add a bit of grated cheese and hot sauce. Roll it up and take a bite. 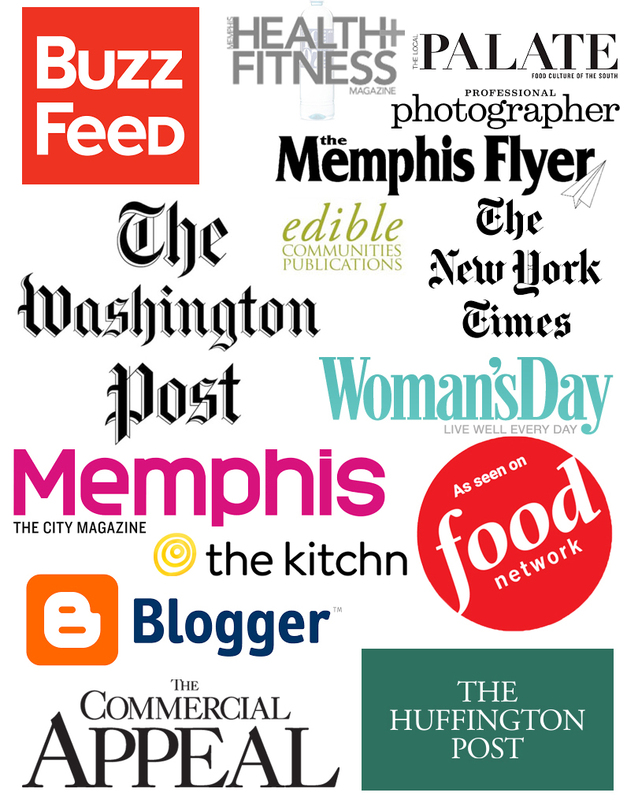 I cut my photography teeth at The Daily Helmsman, the student newspaper at the University of Memphis, over a decade ago. 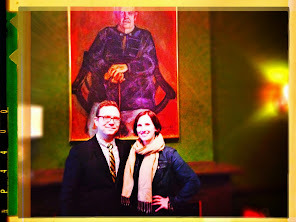 Recently I had a nice chat with my new friend Beth Spencer who is the chief reporter, webmaster, and sole employee of the paper this summer semester. She turned our conversation into a story about my upcoming class on the vegetarian grill complete with quotes from some nice folks who took my last class in March. I was glad to see the kind words of my former students in print, and I feel fortunate to have the opportunity to teach again. Click HERE to view the story in The Helmsman. 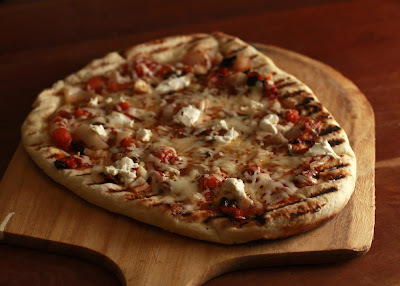 That's right, I said grilled pizza...right on the fire. Wanna learn how to make it? 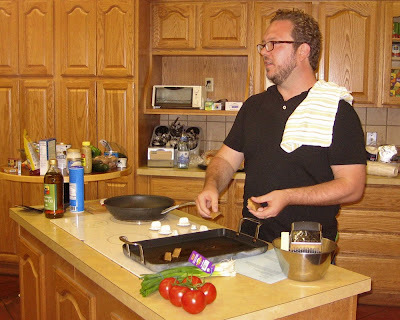 Then sign up for my Vegetarian Grill Class to be held on the 12th of July. Click HERE to register. There are only a few spots left. We will also try some BBQ tofu sandwiches, harissa-marinated seitan skewers, a surprise dessert, and much more. The power's back on, it is 100 degrees outside, and this means we're all about popsicles around here. 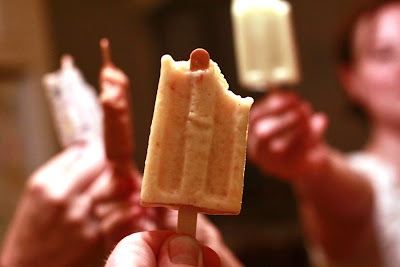 We dusted off a little ten-section popsicle mold from way back and ordered two more this week. Now even our daydreams are popsicle-colored. 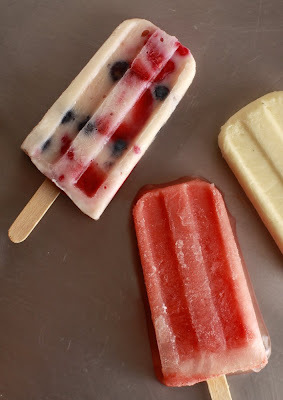 Mix ingredients and use a funnel to pour into popsicle mold. Using metal or plastic top, place sticks in center and freeze for at least four hours. Run warm water on the outside of mold for a few second to help pops emerge. Freeze immediately for 30 minutes. Then you can eat them or pack them up to share. I wasn't sure that packing them up would work, but it was fine -- nothing melted at all. 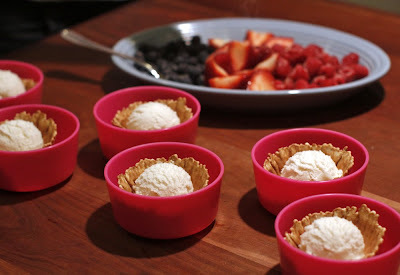 We wrapped them individually in waxed paper, stuffed them in a little cooler with ice, and put them in a bigger cooler. They transported well. TCV's dad suggested trying ginger or jalapeno. We will add those ideas to our list of 100 flavors. Any other ideas? The popsicle molds we use can be found HERE. Farmer Van Cheeseman needs some summer help in Holly Springs, Mississippi. He is a great guy who has beautiful produce and gardens plus cold frames. Post a comment or email vanlee2001@yahoo.com directly if you or someone you know would like to work with him, even if it's for a day before market or a weeklong stint. We were about to lose our minds up in here (up in here). After a fierce summer storm with high winds, we were without power for four long days. We lost everything in the fridge and in the freezer as we waited for MLG&W to get the power back up and running. Among the casualties were some of my sauces that I make in large batches and freeze: smoky BBQ sauce, spicy enchilada sauce, and a roasted vegetable & tomato sauce. A few of my friends are STILL without electricity. If you know people in that situation, please be nice and offer them a cold drink. They are not having a good time. By Monday night we longed for a home-cooked meal. 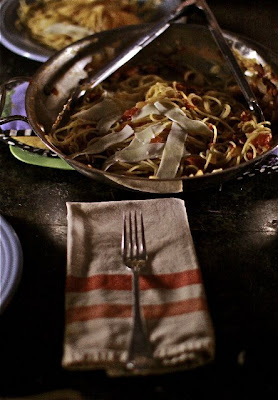 Something as simple as spaghetti with tomato sauce would do. So I fired up my outdoor grill and got to work. 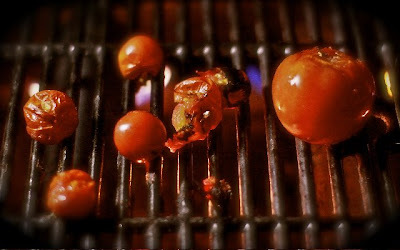 With a pot of water on the side burner starting to come to a boil, I placed all of the tomatoes I could round up straight onto the grill grates. I diced an onion and three cloves of garlic and threw them into a pan with a good bit of olive oil. I set the pan on the grill next to the tomatoes to allow the onion to sweat. Lantern in hand, I made my way to the garden to cut handfuls of fresh herbs to add to the pan: thyme, basil, rosemary, sage, and oregano. A handful of pasta was tossed into the boiling water, and the charred tomatoes were added to the pan and smashed along with a can of diced tomatoes. Once the pasta was cooked, I tossed the pasta with the sauce, topped it with bits of shaved parmesan, and served it right in the pan. Because we were starved for a home-cooked meal, I was ready to dub it the best pasta I have ever tasted. It was good, but I'm not sure about all that. But I am sure that a little bit of innovation and thinking outside of the kitchen may have saved our sanity. This is day 4 without any power. Everything in the fridge and freezer is ruined. I did make a great grilled zucchini sandwich with roasted red peppers and feta. 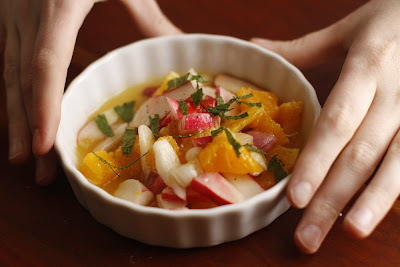 This salad is so simple to make, but it is the presentation that makes it special. This crunchy, refreshing, sweet-meets-sour treat is the perfect salad for the summer. Makes 4 small salads or two large. 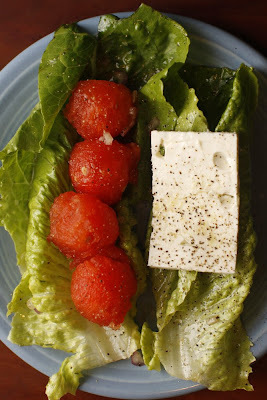 Toss romaine with the dressing and place onto a small plate. Fill one rib with melon balls and place feta over the other. Drizzle with some of the dressing that is left in the bottom of the bowl. Season with sea salt and black pepper. Vanilla Ice Milk Whisk 3 cups milk, 1/2 cup whipping cream, one cup raw sugar, and one tbsp. vanilla. Pour into ice cream maker, let it go, freeze at least an hour. 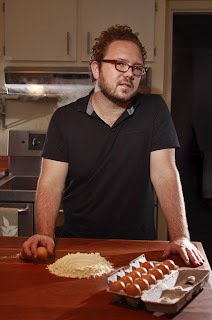 "Living in memphis I have learned a lot from my meat loving city mates. Try a dry rub with paprika, sage, garlic powder, black pepper, and nutmeg. Put that on the tofu to marinate. 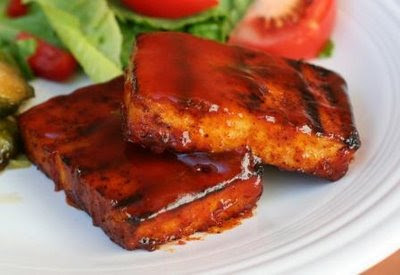 Grill the tofu over high heat to get the grill marks, place over indirect heat, and then sauce it. This method will keep the sugar in the sauce from burning and you have a double wall of flavor." He calls the updated BBQ recipe Memphis BBQ Tofu. 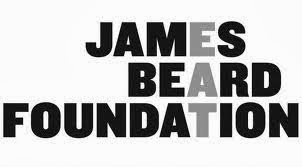 If you have not visited his blog please take the time to do so. He recipes are creative and concise and his photographs are great (that is his tofu photo). On Saturday, The Wife and I returned home from the farmers' market with an incredible bounty. This was the first week squash blossoms were available, and they were the first thing I bought at the market. Then I carried them around with me in a brown paper bag and showed them off to everyone I met. They were $3.50 for 10 flowers, and they had little baby squash attached to them. We also got eggs, beets, nectarines, bread, carrots, and onions. So what do you do with these beautiful flowers? You fry them! I threw together an earthy, sweet filling of one ear of roasted corn, 2 boiled carrots, 3 ounces of goat cheese, 1 clove of garlic, a touch of cream, and a little panko. All the ingredients except the panko went into the food processor and were blended until smooth. Then I used the panko stiffen the consistency. I placed the mixture into a pastry bag and piped the filling into the center of each flower. Next, I lightly breaded the flowers by dipping them in an egg wash and rolling them in a mixture of all purpose flour and panko. 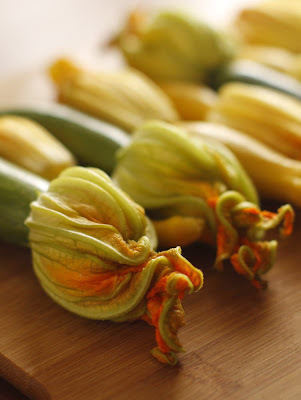 The squash blossoms were then lightly fried in canola oil until golden brown. I served them over risotto made with "Not Chicken" broth and finished with a tablespoon of black truffle butter. What more could you want from a Saturday lunch? We got pretty bored with thinly sliced English breakfast radishes on buttered bread, but had no idea what else there was to do with radishes. I typed in 'radishes' on recipezaar.com and was surprised to see a whole bunch of new options. I wasn't sure about this cold salad at first, but it ended up being really interesting. I added honey to the dressing, and it balanced it out nicely. Do y'all have any other ideas for what we should do with radishes next? Registration Now Open for "The Vegetarian Grill"
I'm teaching another continuing education class. On July 12th I will be talking about how vegetarians can make use of the outdoor grill. We'll do pizza & BBq tofu & seitan skewers & even dessert. It is going to be a blast. Go HERE to register. Don't wait! My last class sold out. There are only a few spots left. *Thanks for the pics Budd! We are loving beets right now, and we got our hands on some from Downing Hollow Farm yesterday at the Botanic Gardens Wednesday farmer's market. Many were nice striped beets, too! The Wife made a salad with bits of honeycomb, thyme, pink peppercorns, and local goat cheese. Boil and peel the beets and sauté them in some olive oil, and then add the rest of the ingredients above -- that's all there is to it. 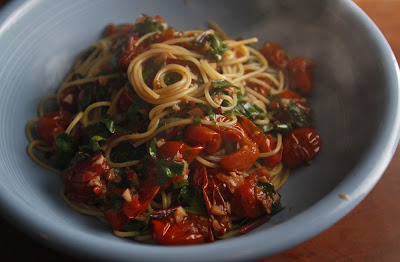 TCV also made summer pasta with Whitton Farms swiss chard, Van Cheesman's garlic, and some broken-apart grape tomatoes. 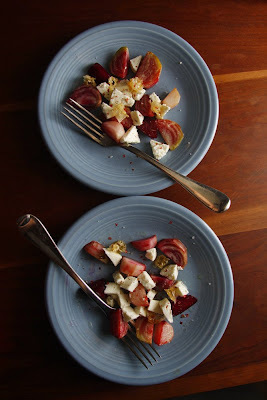 Andria's Summer of Magical Eating potlucks have us trying out our ideas for what to do with local produce all week long now; we'll keep you posted on what we try next. I know many of you are wondering what to do with all of the snow peas that keep showing up at the market and in your CSA boxes. I have a bold suggestion for you. Eat 'em raw. Seriously, they are delicious. If you like edamame, then you will love this healthy snack. 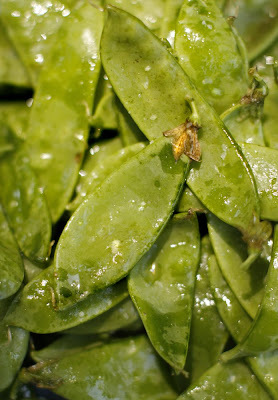 Wash your snow peas and dry them. Then toss them with a tablespoon or so of good-quality olive oil and top with a pinch of nice flaky kosher salt. The taste is sweet, clean and grasssy. Try it.